Hot coffee, the elixir of early risers and sleepy people everywhere. Its hard to imagine a world without a nice cup of coffee waiting for us to soothe our souls, perk us up or bring us back to life. In a perfect world, coffee would make itself while I was still in bed and arrive at my bedside via a tall blonde bodybuilder with a subtle European accent of some kind. I can dream, can’t I? In the meantime, there’s iKettle, allowing you to instantly control hot beverage making from anywhere in your house by using your iPhone. Simply set your system to Wake Mode, and the next morning you will be gently called to consciousness and asked if you would like to have the kettle on. ( not sure about the accent) If your answer is yes, you will later be asked if you’d like it to be kept warm. Maybe coffee isn’t your thing and it’s a nice relaxing cup of tea that get’s you rolling. iKettle has four precise temperature settings, designed to help you achieve the perfect brew whether it be green tea, or java. With its sleek stainless steel design, and one-touch settings, the 1.8 liter iKettle can wake you up, or welcome you home with a steaming hot beverage. And let’s face it, where would you keep a tall blonde bodybuilder anyway? 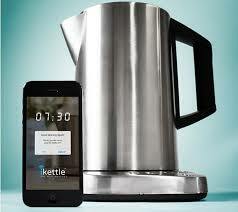 iKettle is easy to clean with a removable heating element, has an automatic shut off, and boil-dry protection, works with your homes WiFi connection and will be available for delivery in the UK in a few weeks, no word yet on when it will be available here in the States, but I’m hoping it’s very soon. The iKettle can be pre-ordered from firebox.com for right around 160 bucks. We’ll keep you posted when it jumps the pond.